True Prosperity | Choose Your Energy: Change Your Life! Sometimes, success can be lonely. Just read the biography of any business baron who died rich and friendless. Indeed, there is a difference between achieving success in a selfish effort to serve oneself and achieving success while dedicated to the service of others. 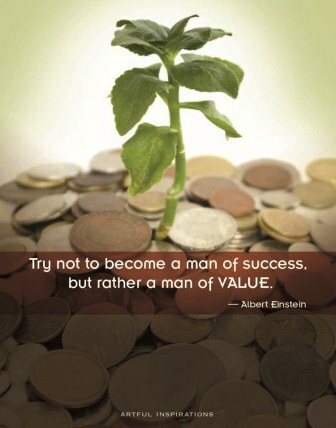 True success and value come when we take our eyes off ourselves and focus on the benefit of others. Think about the people you know who enrich the lives of those around them. Maybe you’re one of them. More times than not, they are looking outward, considering how they can meet the needs of others and make an impact on their world. How can you help? How can you improve things for others? How can you change the world for better? When you are driven by your values, you seek to leave the world a better place than when you found it. Kinder, healthier, safer, happier. It’s not about selflessness or martyrdom, it’s about impact. Real wealth is not just about the bottom line. It’s about lasting value and meaning. When you strive to serve as you achieve, you enrich yourself and every being and situation you encounter.